Description: Module principle of synthesis of the adaptive stochastic processes control systems is considered on the basis of bayesian approach. The offered structure of the multidimensional control system contains the modules of choice of order of model, evaluation of parameters of model, choice of strategy of management, prognostication of management quality. Udovenko, S.G. and Perepelitsa, V.I. 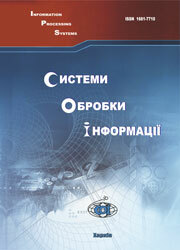 (2008), “Modulnaia sistema adaptivnogo upravleniia stokhasticheskimi protsessami”, Information Processing Systems, Vol. 5(72), pp. 123-127.